Black Ice Software - Tiff Viewer version 11.49 is released! Stability improvement for loading 32 bit Tiff images and for License Checking on Citrix when multiple users are using the Tiff Viewer in parallel! Black Ice Software has released version 11.49 of the Tiff Viewer. This version includes stability improvements for opening Tiff files with 32-bit images. 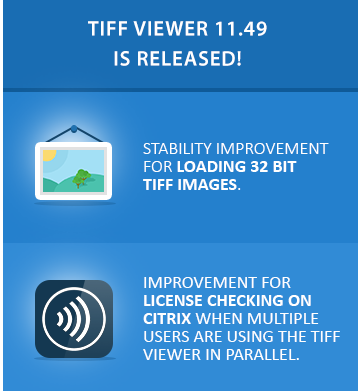 The latest release of TIFF Viewer version 11.49 also includes stability improvements for the license checking on Citrix systems, when multiple users are using the Tiff Viewer in parallel.